P. Licinius Saloninus, son of Gallienus and Salonina, grandson of the Emperor Valerian. When his father and grandfather assumed the title of Augustus in A.D. 253, the youth received the designation of Caesar. Some years afterward he was left in Gaul, and was put to death upon the capture of Colonia Agrippina by Postumus in 259. Obverse: SALON VALERIANVS CAES, Radiate and draped bust right. Reverse: PIETAS AVG, Emblems of the pontificate: lituus, secespita, guttus, simpulum, and aspergillum. Obverse: SAL VALERIANVS CS, Radiate and draped bust right. 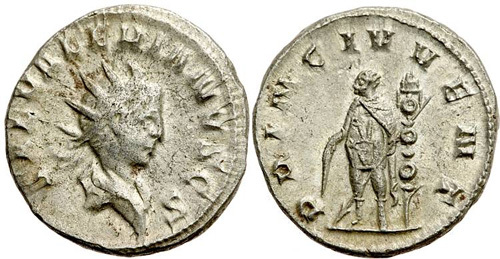 Reverse: PRINC IVVENT, Saloninus standing facing, head left, holding baton and transverse spear; signum to right. 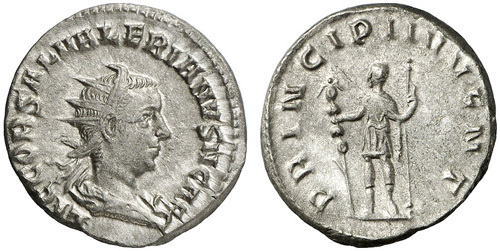 Reverse: PRINC IVVENT, Saloninus standing left, holding baton in right hand, transverse scepter in left; two standards behind. 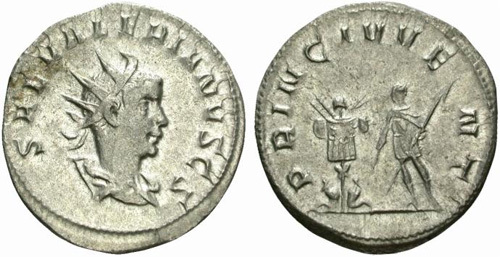 Reverse: PRINC IVVENT, Saloninus standing left, holding baton in right hand, transverse scepter in left; with trophy and captives. Reverse: SPES PVBLICA, Spes advancing left, lifting dress with left hand and holding flower in right hand. Obverse: IMP SALON VALERIANVS AVG, Radiate and draped bust right. Obverse: LIC COR SAL VALERIANVS N CAES, Radiate and draped bust right. Reverse: PIETAS AVGG, Sacrificial implements : Lituus, knife, patera, ewer, simpulum, and aspergillum. 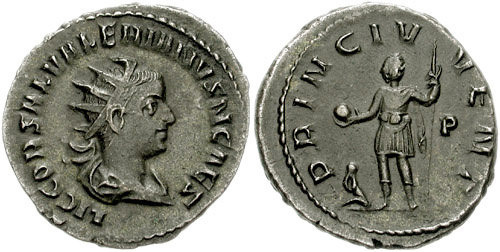 Reverse: PRINCIPI IVVENT, Prince standing left, holding ensign and spear or sceptre. 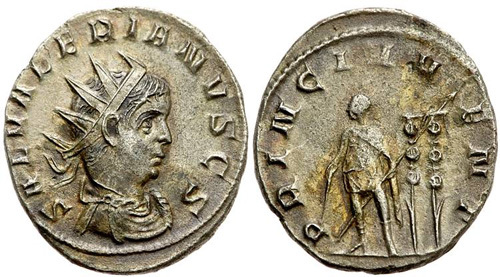 Reverse: PRINC IVVENT, Saloninus standing left, holding globe and spear; captive at feet left, P in right field.